An illustration from the Bubishi, an ancient Okinawan text showing Chinese martial art energy striking points related to the time of day. Editor's Note: This is Part 1 of a series of articles by Bock. Part 1 discusses Bocks strategy of reverse engineering ancient healing herbal medicine formulas to heal trauma. Future articles will attempt to determine probably targets and the body energy disruptions produced. Bock also introduces a novel concept, "spotting," which differs in concept from neurological strikes. Chinese martial arts are associated with traditional healing arts for the very practical reason that martial artists get hurt and need medical care. As a result the medicines for trauma due to the martial arts training are specific to the nature of martial arts injuries. The martial techniques of spotting or the targeting acupuncture points on the body as a fighting tactic, create a very different kind of injury. Deconstructing the medicines used to treat injuries created by spotting can reveal much about how the human body responds to the violent stimulation of an acupuncture point. When acupuncture points are used in healing, the point is stimulated with a needle or other method to induce change into a particular dynamic of the body. Needling a point on the body is generally considered very safe because the mild stimulation is meant to encourage a bodily function or energy flow that is already present within the body. In the practice of spotting, the injuries are going to be different than a simple strike or trauma to the body. The targeting of points is not focused on the immediate tissue but rather on the flow of energy/Qi through the various organ systems associated with that point. The medical treatment would not be specific to tissue damage, but rather the affect of the violent stimulation of a acupuncture point on the functioning of the body as a whole. The result of any type of strike is going to be pain. The important part of medical diagnosis is to determine the nature of that pain. 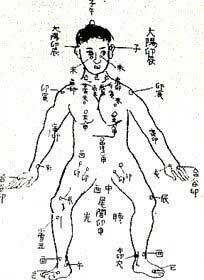 Pain is by definition in Chinese herbal medicine a blockage or stagnation of the flow of Blood* or energy (Qi/Ki). The treatment therefore is to use herbs that re-establish the proper flow in the body. In herbal trauma formulations (Tieh ta, Die Da**) the goal is to move Blood as defined by Chinese medicine to reduce pain. Often Tieh ta formulas contain ingredients to stop bleeding, heal tissue, and reduce pain. In the book Shaolin Secret Formulas for the Treatment of External Injury, the authors and translators document the various herbal treatments for injuries seen in the practice of the martial arts. The section on spotting covers the treatment of injuries that result from the spotting of almost 100 different points on the body. Each targeted point has a treatment specifically formulated to address the likely result of a focused attack on that acupuncture point. reveals much about the general effects of spotting injuries. The main ingredients of the 13 Flavor Formula fall into the category of “moving Blood”. These ingredients are common in trauma formulas. They reduce fixed located pains and provide some nourishment to strengthen tissue repair. Each of the Blood moving herbs has a slightly different medicinal affect. This results in a formula that is meant to relieve many types of pain in a systemic fashion. While Blood function in the body is related to nourishment and pain that has a fixed and located nature, the movement of Qi is related to the regulation of body systems and the odd diffuse “I don’t quite feel right” kind of pain. To clear this type of dynamic requires herbs that regulate or move Qi in the body. Finally two accessory herbs are included to enhance the main herbs and help the body recover. Yuan Zhi/ Radix Polygalae Tenuifoliae - decreases swelling and opens up clogged channels in the body. More importantly it calms the spirit and helps the mind and body to relax. In general the focus of the 13 Flavor Formula is to reestablish the normal functioning of the body in a very general way. Depending on the functional nature of the point that was spotted or the symptoms that are expressed, herbs could be added to this formula to deal with the specific symptoms that are presented. Most of the modifications noted in the records are composed of adding herbs that enhance functions that are already present in the 13 Flavor Formula, such as pain relief, or moving the digestion. This would suggest that this formula was designed to be used as a first line treatment. It was general enough to be used even if the specifics of the spotting injury were not known. The deconstruction of the 13 Flavor Formula shows that the use of spotting causes not only disruption but also directional changes in the natural flows of energy within the body. It would create an inward flow of energy disrupting the flow of blood and energy upward to the head and outward to the outer channels and defenses of the body. It also disrupts the normal downward flow of energy in the digestive system, which could result in nausea vomiting, and constipation. As all bodily functions are interrelated, the choice of point could create a cascade of functional disruption to the body. A healthy person naturally resists this type of disruptive force, and may have the constitutional strength to recover from a spotting attack. The 13 Flavor Formula was constructed to encourage natural flow of Blood and Qi in the body to counter any disruptive flow that may have been forced upon the body. Standard notation in translation of Chinese medical texts is to refer to “blood” (lower case “b”) as referring to the biological concept of blood- namely the red fluid. “Blood” (upper case “B”) is used to refer to Blood in the Chinese medical sense which expands on the blood concept to include bodily functions related to nourishment, regulation of physical and emotional function as well as pain. David Bock, C.Ac. Dipl.OM,FABORM, is a teacher of Wadokai Aikido (under Roy Suenaka Sensei), a Wisconsin Certified Acupuncturist, NCCAOM National Board Certified in Acupuncture and Chinese Herbology. He can be reached at www.davidbocktcm.com. Bock is a frequent contributor to FightingArts.com.